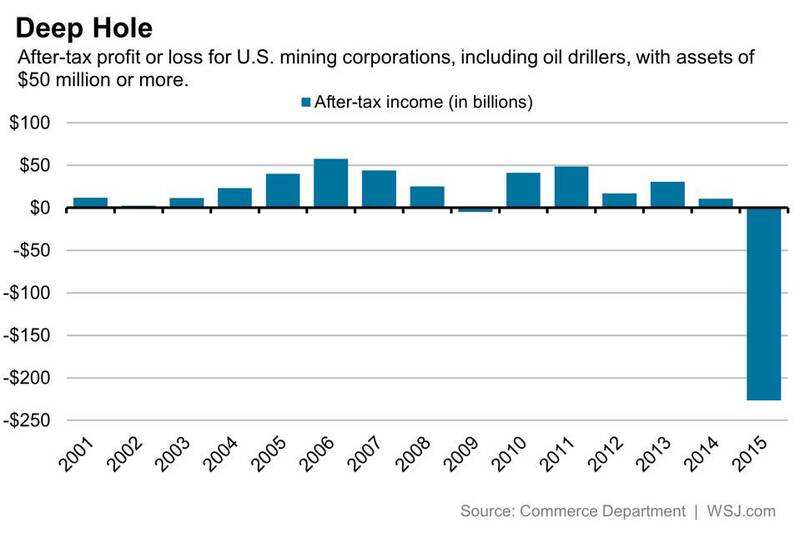 The U.S. mining industry—a sector that includes oil drillers—lost more money last year than it made in the previous eight. Mining corporations with assets of $50 million or more recorded a collective $227 billion after-tax loss last year, according to Commerce Department data released Monday. That loss essentially wipes out all the profits the industry had made since 2007. A crash in oil prices last year caused significant losses for what had been an upstart domestic energy industry propelled by petroleum reserves accessed via hydraulic fracturing, or fracking. Crude oil prices fell from above $100 a barrel in the middle of 2014 to less than $40 by the end of last year. That meant many of those new wells were suddenly operating at a loss. What’s more, other types of mining operations were stung by falling commodity prices tied to weak demand from China and other parts of the globe. Mining revenues also fell sharply, down 38% in the fourth quarter from a year earlier. A faltering global economy also stung the manufacturing sector, though the industry remained profitable. The sector recorded a $510 billion annual profit, down from $609 billion in 2014. But manufacturing revenue declined 7.8% in the fourth quarter from a year earlier. Falling revenues suggest weaker global demand for U.S.-made goods. That’s likely a symptom of a stronger dollar making American products relatively more expensive overseas. 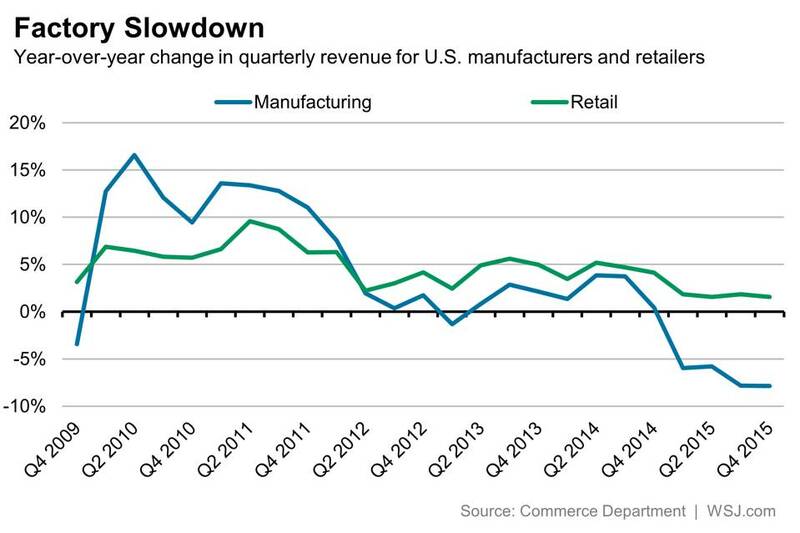 The declines come despite steady, if unspectacular, demand on the part of U.S. consumers. Retailers’ revenue grew 1.5% in the fourth quarter from a year earlier. Annual revenue growth was between 1.5% and 2% all of last year. Retail sales tend to match up with other measures of consumer demand.